The Student Centre is your number one point of contact. Our staff will provide advice on your enrolment, subjects, fees, support services, scholarships, exams and even directions! We are located in Education Central, Building 134 (Map) near the Student Mall. We are located in the Chancellery, Building A1 (Map). Basically, we are your help line. If we can't answer your question, we will point you in the right direction. Phone (07) 4781 5255 or freecall (within Australia) 1800 246 446. Phone (07) 4232 1000 or freecall (within Australia) 1800 246 446. General enquiries are welcome and may be forwarded to enquiries@jcu.edu.au. Enquiries relating to specific disciplines should be directed to the relevant Divisional Enrolment Team. If you have a question, check AskUs – it’s a 24/7 online enquiry database with answers to more than 1,000 commonly asked questions. 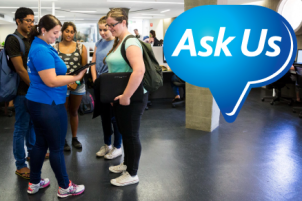 Ask Us has information on enrolments, applying to JCU, fees, scholarships, social events, calendars – everything!